Jang Song Thaek had been seen as a kind of regent to Kim Jong Un, the young successor to the Kim family dynasty, and was thought to be number two in the regime. But Jang owed his position to his wife, Kim Kyong Hui, the only sister of Kim Jong Il, Kim Jong Un’s deceased father. Jang’s tact, as well as his usefulness as an interlocutor with China, enabled him to keep his position, despite his long-term separation from his wife. But in North Korea, blood is paramount: everything, including ideology and the national interest, is subservient to the maintenance of the Kim dynasty. I have long believed that the true holder of power since Kim Jong Il’s death has been his sister, Kim Kyong Hui, and no one else. Her blood tie to the Kim dynasty is the reason why, even after her husband was purged and executed (and the rest of his family rounded up), she maintained her political position. It has even been suggested that she made the decision to purge her husband. Though it cannot be known whether she also proposed killing him, it is not surprising that she believed that, with her own health failing, she could not leave the family dynasty to her husband’s care. On Dec. 17, the first major ceremony following the purge and execution of Jang Song Thaek, Choe Ryong Hae, vice chairman of the Central Military Commission of the Korean Workers’ Party, was conspicuously present on stage at the commemoration of the second anniversary of “Dear Leader” Kim Jong Il’s death. With Jang purged, responsibility for economic failure in North Korea has been shifted to Choe. All officials and people related to him now live under the shadow of the executioner, for he is certain to bear the blame when the dynasty needs a scapegoat for its mounting problems. The day is fast approaching when Kim Jong Un and his clan will have to take responsibility for the country’s dire condition, and it may come soon after Kim Kyong Hui dies. If so, the Kim dynasty’s last chapter may have begun with the current spasm of executions, though the ending — for the Korean Peninsula and East Asia alike — remains very much in doubt. North Korea’s deputy ambassador to UNESCO returned home Monday after being recalled as part of a purge prompted by the execution of the once-powerful uncle of leader Kim Jong-Un, a report said. Hong Yong, the North’s deputy permanent delegate to UNESCO, and his wife were spotted at Beijing airport Monday before taking the flight to Pyongyang, South Korea’s Yonhap news agency said. Hong, one of Jang Song-Thaek’s associates, took the post only six months ago, it said, quoting a diplomatic source in Beijing. Yonhap said earlier this month that Jang’s nephew and the North’s ambassador to Malaysia, Jang Yong-Chol, had been recalled. It said last week the North’s ambassador to Sweden, Pak Kwang-Chol, and his wife had also been summoned back to Pyongyang. Pak, who had taken the post in Sweden in late 2012, was seen at Beijing airport being escorted by North Korean officials before taking the flight to Pyongyang on Friday, Yonhap said. Ryoo Kihl-Jae, South Korea’s unification minister in charge of cross-border affairs, told a parliamentary committee on Monday that the North has been purging officials close to the executed uncle. “We are seeing signs that those who were deeply involved with Jang are being recalled and purged,” he said. The purge however appears to be targeting a relatively small circle of officials, Ryoo said, rejecting speculation of a sweeping clear-out of party and military ranks. On December 16, a large assembly of the Korean People’s Army (KPA), as well as the Navy, the Air Force, and the Anti-Air Force of the KPA gathered outdoors at the plaza of the Kumsusan Palace of the Sun in Pyongyang for the purpose of pledging their loyalty to Kim Jong Un. Within two months of the death of Kim Jong Un’s grandfather (Kim Il-sung), Kim Jong-il was nearly assassinated. There were many subsequent uprisings against him, but the most sensational was that by the VI Army Corps in North Hamgyong Province in northeastern North Korea. The entire leadership of that corps rebelled against “The Great Leader” in April 1995. The coup was thwarted and forty officers were killed and 300 men severely punished. Many senior officers fled to China. The effect of that coup attempt was to make Kim Jong-il entirely dependent on the army. He abandoned any pretense of pursuing economic openness and replaced it with the “military first” doctrine still in use. Similarly, Kim Jong Un’s dependence on the army seems to have been consolidated by a failed coup attempt. Former NBA star Dennis Rodman arrived in North Korea on Thursday to meet leader Kim Jong Un and put the finishing touches on plans to bring 12 ex-NBA players to Pyongyang for a Jan. 8 exhibition game marking the leader’s birthday. Rodman said the game is on track despite the recent execution of Kim’s uncle in a dramatic political purge. Rodman’s visit comes less than a week after North Korea announced the execution of Jang Song Thaek, an unprecedented fall from grace for one of the most powerful figures in the country. But officials in Pyongyang say Jang’s removal has not caused any instability. Rodman’s visit – should it proceed uneventfully – could be a sign that Kim is firmly in charge. Rodman told The Associated Press in a brief interview at his Pyongyang hotel that he was undaunted by the recent political events. Rodman has mostly avoided politics in his dealings with the North. He’s mainly focused on using basketball as a means of boosting understanding and communication and studiously avoided commenting on the North’s human rights record or its continued detainment of an American, Kenneth Bae, for allegedly committing anti-state crimes. “North Korea has given me the opportunity to bring these players and their families over here, so people can actually see, so these players can actually see, that this country is actually not as bad as people project it to be in the media,” he said. North Korea on Tuesday marked the second anniversary of Kim Jong Il’s death. Its political and military elite held a massive memorial in the capital Pyongyang, where they pledged their loyalty to his son and successor, Kim Jong Un. Meanwhile, in South Korea, 10 defectors from the North held a very different kind of ceremony. North Korea yesterday put to rest rumors that its “Dear Leader” has had his wife bumped off. Speculation was rife after dictator Kim Jong-un’s wife Ri Sol-Ju had not been seen for several weeks, this following the dramatic purge which saw ruthless Jong-un order the execution of his uncle Jang Song Thaek. But yesterday the secretive Communist state broadcast video footage of the stony-faced 30-year-old tyrant arm-in-arm with Ri at a parade to mark Monday’s second anniversary of the death of his father Kim Jong-Il. Ri, along with Jang’s widow Kim Kyong Hui, are regarded as the power behind the throne – two key women the unpredictable Jong-un turns to for advice. 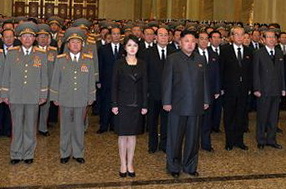 Note: Kim Jong Un’s aunt, Kim Kyong Hui, did not appear at Tuesday’s memorial. The young North Korean leader, Kim Jong Un, learned from the most ruthless and long-lasting of modern dictators. His uncle Jang Song Thaek, publicly humiliated during a meeting of the party’s Central Committee as two uniformed soldiers grabbed Jang — until recently the country’s second most powerful man — was then taken away and accused of betraying Kim and the revolution. These were amongst the stunning ledger of charges, and one that makes no effort to conceal there is a power struggle in North Korea. Tellingly, the accusations speak of a Jang Song Thaek “group,” which suggests the purge is far from over. Jang is being erased from the records. The man who stood at Kim’s side when his father died is being Photoshopped out of existence. All mentions of him — except for the condemnations — are disappearing from the website of the Korean Central News Agency. And every photograph is now suddenly, and not-so-mysteriously, free of his image. He has even been deleted from a recent documentary about Kim Jong Un. 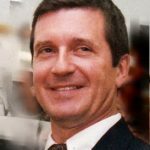 The experience from Saddam’s Iraq suggests that a reign of fear among the powerful serves only to entrench the harshest policies. High-ranking officials, worried about appearing weak or disloyal, will be more reluctant to suggest reforms that loosen the regime’s grip. Kim is consolidating power, building his own inner circle of trustworthy loyalists and daring anyone to defy him. The young heir who rose to power two years ago under the protection of an experienced uncle is sending notice that he is not a child any more. The dictator is all grown up and settling in for a long time in power. The execution of the North Korean leader’s uncle is “an ominous sign” raising concerns about instability in a nation pursuing a nuclear arms drive, US Secretary of State John Kerry warned on Sunday. Kerry told ABC television that the shock move showed the world “how ruthless and reckless” Kim Jong Un is, and likened him to late Iraqi dictator Saddam Hussein. “It’s an ominous sign of the instability and of the danger that does exist,” Mr Kerry said in the interview carried out during his trip to Vietnam. “To have a nuclear weapon, potentially, in the hands of somebody like Kim Jong (Un) – just becomes even more unacceptable,” Mr Kerry said. Kim’s regime has vowed to boost its nuclear “deterrent” but has said it would welcome a resumption of talks that previously promised aid for disarmament. It’s most unlikely that Jang Song-thaek was really planning a coup, but all of his suspected allies and associates in his own department and other parts of the government, plus any senior military officers suspected of less than total loyalty to Supreme Leader Kim Jong-un, are in grave danger. Only two of Jang’s aides have been killed so far, but hundreds or thousands of other people thought to be linked to him may suffer the same fate. It’s also the first time that the regime has publicly admitted that there are rival factions in the senior ranks of the Workers’ (Communist) Party. It’s hard to believe that this will not be followed by a wider bloodbath among the leading cadres along the lines of Stalin’s purges in the former Soviet Union and Mao Zedong’s in China.